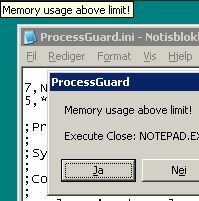 ProcessGuard is a great little program that basically allows you to watch the processes. When they go above a certain threshold then you can either kill the process, or start an application, or shutdown, hibernate, … all sorts of crazy things. This configuration is done via an ini file so you can edit it and relaunch the application whenever and wherever. Freeware for Windows.